If we were having coffee it would almost definitely be tea and I’d tell you that I feel an urge to tie up loose ends. What I mean is, I have an itch to finish projects, tidy things up, file papers, make decisions, clear my desk. Is it because it’s almost the end of another year that I feel this way? It’s as good an explanation as any. For the last year I’ve had the feeling that I’m coming to the end of a big writing splurge which started around 2009/2010. Before then, I had a long spell of not being able to write or even read very much. 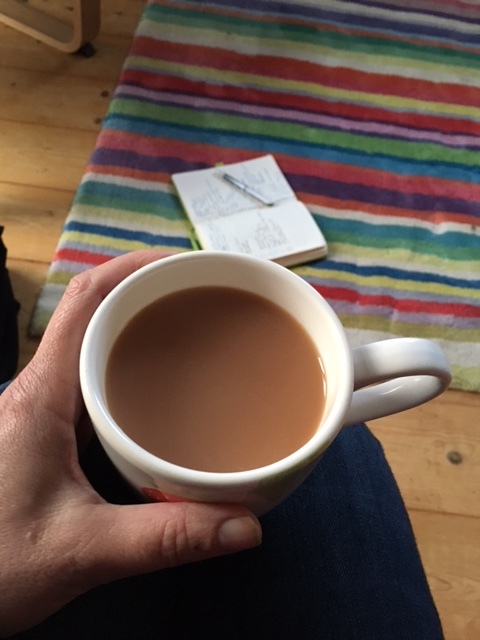 Raising two children had left me quite weary and I found it hard to concentrate so I tried reading graphic novels because I felt I could cope with smaller chunks of writing. And there were pictures! 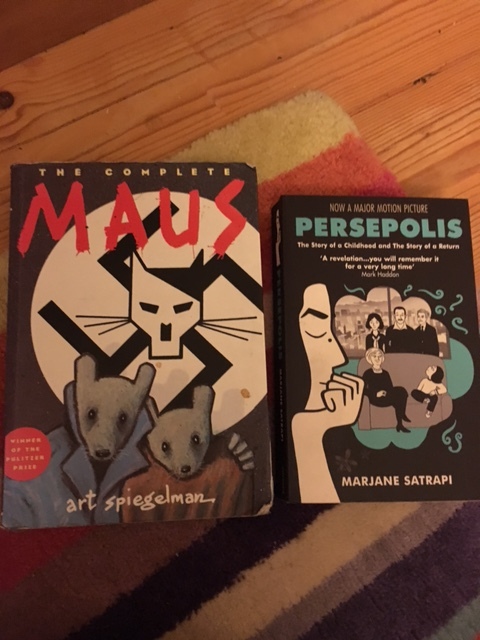 Maus and Persepolis made me consider different styles of storytelling and showed me ways into writing personal histories and the importance of getting things down on paper before you forget – or before someone dies. At about the same time, I was working as a teaching assistant in a local comprehensive school and I was obliged to read the same set texts the GCSE students were reading so that I could help them with their coursework. I read a lot of Seamus Heaney, Ted Hughes, Sylvia Plath and Carol Ann Duffy. And the idea came to me that I might be able to say what I wanted to say through poetry, something I’d written very little of up until then. So I began reading again. Reading and reading and reading…. and gradually, the writing came back and I wrote poems. 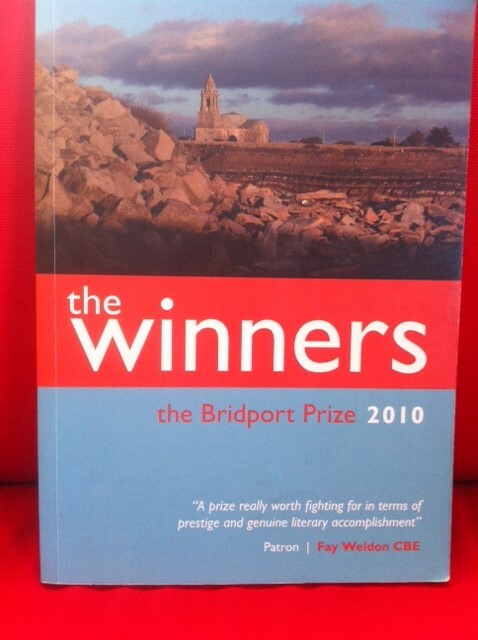 So I sent in my poem, ‘Honeymoon’, and it didn’t win £5,000, it won £50 but I gave up my job anyway and ‘Honeymoon’ was published in an anthology (because it was a runner-up) and I went to Bridport to collect my prize and I took part in Michael Laskey’s workshop (he was the judge) and he gave me a copy of Smiths Knoll the magazine he edited so then I had more poets to read and more to find out about (Michael’s workshop had given me lots of ideas). I’d also started teaching writing at a local adult education college, so I had a small income. This was when I got the urge to be more published and to publish a whole book or pamphlet of my own. So from 2010/2011 I started working towards that goal, reading poetry, buying books and magazines, teaching classes and taking classes and workshops and sending off my poems to magazines and competitions. 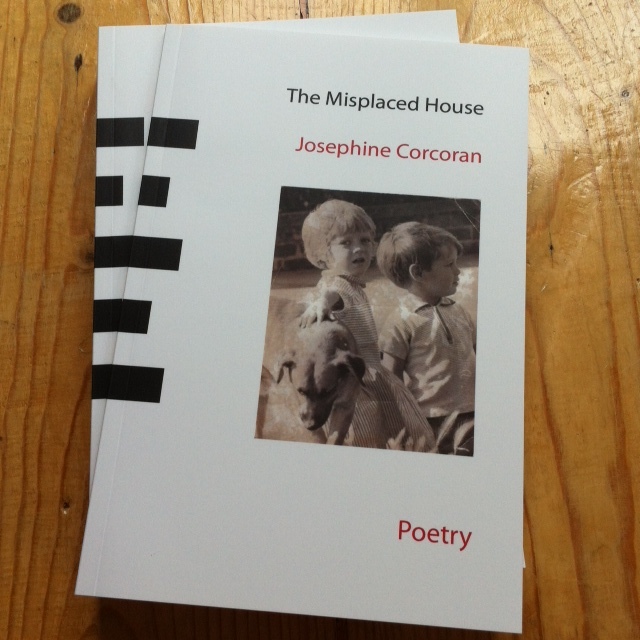 Then, two years ago, tall-lighthouse published my first pamphlet The Misplaced House and it was a very happy day. So if were having coffee (tea) I’d tell you all of this in a rush and your eyes would probably glaze over but I wouldn’t be offended. But the thing is I have this surge of energy now to finish stuff, I’d tell you. So I’ve finally sat down with all of the poems I’ve written since The Misplaced House, I’ve finally put them into some sort of order, I’ve finally faced up to the fact that a large number of them are not actually poems at all and are nothing more than vague musings and scrappy phrases. And I’ve put all of those in a folder which feels satisfying and not depressing at all. They were just dead weight, I’ve finally realised. There are still a few more jobs to do. I’ve submitted the poems to various places and I still have a few more to send. And then I want to start something new which feels rather exciting. I’m not sure what it will be. It might be poems or it might be something else. I feel I want to write about something else and in a different way. However vague this sounds to you, I’ll probably spill my tea all over myself and you as well because even though it’s a completely half-formed idea, it feels promising. Thanks to Diana for the idea of a #weekendcoffeeshare. More info here. Plays Josie! Aplayaplayaplay…..she calls out with great excitement. I’m be been meaning to ask if you had considered another play. Best wishes for whatever new venture. Things in life often seem to me to have approx. 7 year cycles/ transitions – it seems to me. I found this post very interesting. It’s got me wondering about my own stuff too. I started poetry writing around the same time as you. I have a sense that my reading has been more haphazard than yours … That’s something I’ve been feeling a need to do lately … more reading … more study and reflection. Great post. Thanks. No, my eyes wouldn’t glaze over at all. It’s a fascinating journey and one I can kind of identify with but only kind of …. Being a poet is a noble calling. I wish you all good fortune. One of my favorite therapies is tidying up! Glad you found the time 🙂 Thanks for coffee. Congratulations on earning the prize with your porm. Good luck with your poems. Good luck with your writing. I enjoyed your story and my eyes definitely didn’t glaze over. I always enjoy reading about the journeys of other writers because it gives me hope about my own. One of the best blogs of your series this month! I do concur that the best way to write is to read.